The Society's Quarterly is published four times a year and features over twenty-four pages of 19th-century images, articles of interest, Society and Photography news, and reviews of recent publications and exhibits. Classified and display advertisements are available, as well as research inquiries for Society members. 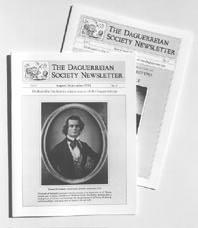 The Daguerreian Society Quarterly will be published in PDF format starting in 2016, but printed copies can be purchased at an additional charge with membership dues. As a sample we offer the Jan.-March 2016 issue here. If you have an idea for a short article (up to four-five pages in length) for the Quarterly, the Publications Committee would be happy to review it for possible publication in the Quarterly, or, if more appropriate, in the Annual. Article inquiries can be sent or emailed to our offices. Remember that the Society is interested in quality articles on all areas of 19th-century photography, not just daguerreotypes. Hard copy or high quality jpegs (300 dpi) of original images should accompany any article. They should be of sufficient size to be run in actual size in the publication. If you have a research query we would be happy to publish it in our next Journal (there is no charge). Research queries can be sent or emailed to our offices. A paragraph or two is fine and, if you wish, a small illustration can be included. Hard copy or high quality jpegs (300 dpi) are acceptable. We would hope that one of our members worldwide may be able to provide you with images or information to assist in your research. Reduced rates are available for repeated runs -- for details contact Diane Filippi at info@daguerre.org. No prepayment is required. It is easier to just send you an invoice after the ad has run. If needed, we do offer art dept. and layout services at reasonable rates. Just send us any prints (B&W or color, print or transparency) and the text and we'll scan them and lay it out, sending you a proof for approval. For full details of terms, rates and layout requirements for advertising in the Journal (and the Annual), contact the Society office at info@daguerre.org.